You voted (nearly 10,000 of you!) and now our first female in our Cincinnati Legends Series is here. Please join ArtWorks to celebrate and dedicate Swing Around Rosie on Saturday, October 8. Light refreshments will be provided. 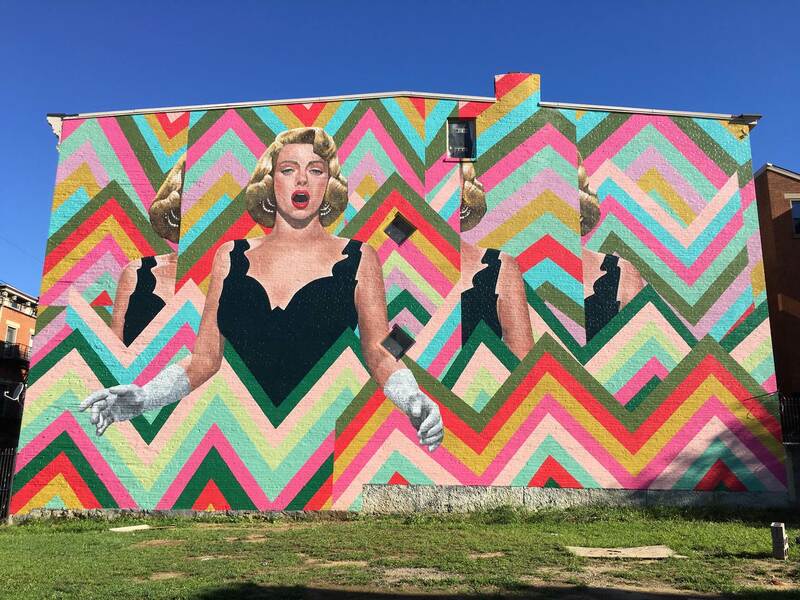 Enjoy learning more about Rosemary Clooney and her Cincinnati legacy, live music, a photo booth and remarks from mural partners and artist Natalie Lanese. Adding to the Cincinnati Legends Series, ArtWorks partnered with the Cincinnati Enquirer to give power to their readers to elect the subject of the first female legend to be honored in Over-the-Rhine. The public chose Rosemary Clooney from a list of greats that included: Louise Beavers, Harriet Beecher-Stowe, Dorothy Kamenshek and Mamie Smith. Known to her peers as Rosie, Clooney was one of the shining stars of Hollywood during the height of radio and television entertainment. She was most successful and respected in American pop culture during the mid-to-late 20th Century for her timeless acting and musical talents. This mural project, which measures 3,285 square feet, provided an opportunity for the community of Over-the-Rhine, along with local representatives, residents, and business owners, to engage in the mural process. The ArtWorks Cincinnati Legends Series celebrates and shares the story of iconic figures that have shaped Cincinnati and left a lasting legacy in the city. Other murals in this series include the mural titled “Annie ‘Little Sure Shot’ Oakley”, the 2015 murals, “James Brown: Mr. Dynamite” and “Ezzard Charles: The Cincinnati Cobra”.